These days when we think of Barnes & Noble, there’s always a second thought immediately after — “What the heck is going on with that company?” After years of whispers, exits, and declining sales, Barnes & Noble says it’s finally going to go ahead and spin off its Nook business, separating it from the retail part of the company. 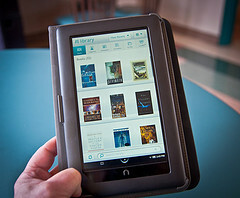 Barnes & Noble has seen sales sliding at its bookstores and in the e-reader business, which is likely a big part of the reason why they’re splitting off now into separately traded companies. The idea being, they can sink or swim on their own without dragging the other down with them. Bloomberg reports that the spinoff will be all signed and sealed by the first quarter of next year, according to the company. Sales are still dropping, with fourth-quarter results today showing continuing Nook losses as well as a dip in comparable sales at its stores. It’s unclear who gets the kids on which weekends, but at least it sounds like no one is blaming each other.